Keep Calm and Climb on! 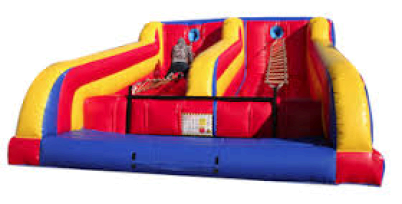 This amazing inflatable will test you agility, balance, and strength. Race your friends to the top and see who can make it to the end of the jungle bars first! Great for all ages. Difficulty is a 8/10. This unit is for serious climbers that are ready for a challenge. The Jacob Ladder is WNY best and safest ladder climbing inflatable that is fit for anyone who wants to give it a shot. The strong padded metal bars and anchoring points on the back of the unit ensure stability and safety for all riders.